Tiopira Te Huia says he does as his heart dictates. That dictation made him an artist. That artistry led him to the Mihiroa Marae Training Center, which in partnership with the Takitimu School of Performing Arts was commissioned to produce the huge Maori emblem for the entranceway to the New Zealand Embassy in Japan. The installation of the carving brought Tiopira to Tokyo recently, the carving and the man being spotlit during New Zealand’s celebrations of its 50 years of diplomatic representation here. The San Francisco Peace Treaty of 1952 laid the foundations for the opening of the New Zealand Legation in Tokyo. The Japanese Legation in Wellington opened the following year, and both acquired the status of embassy in 1958. The two countries were linked by strong ties for a hundred years previous to the formal, postwar arrangements. Tiopira is proud of his Maori lineage and its traditions, expressions and romantic legends. The early people of New Zealand, the Maoris are of seafaring stock, a Polynesian group linguistically and ethnically. Perhaps, centuries ago, they voyaged by canoe from islands of the eastern Pacific and put ashore in this far, temperate country. They found a well-watered, fertile, quiet region of forests and grasslands, flowering plants and tall tree ferns, lakes in alpine settings. Divided into tribes, they settled to agriculture and to observing their beliefs and customs. They revered their gods of nature, sang their songs and danced their dances. They found greenstone to sharpen into tools and shells to polish for decorations. Their women plaited and weaved as well as cooked. The Maoris initially resisted the Europeans who arrived in New Zealand much later. Eventually the different peoples achieved considerable harmony claimed as a model for societies. 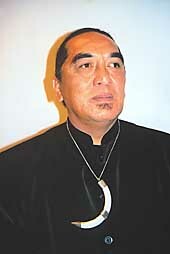 The Maoris constitute about 7 percent of New Zealand’s population. According to Tiopira, intermarriage is increasing. Tiopira’s brother, Paratene, who came with him to Tokyo, is at home a tribal elder. His duties, he said with typical Maori ease of manner, are to do what others tell him. Both men agree that the widespread and increasing use of the Maori language in New Zealand underlines the bicultural nature of the country. In Tiopira, a giant of a man, the strains of his heritage came together when he took up art. 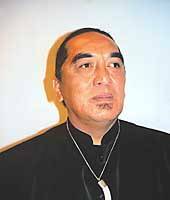 He attended the Hato Paora Maori Boys College in Fielding, New Zealand. Early in life he moved through the modern trades of car painting, working in abattoirs and sound recording before electing to settle with carpentry. He refined his work with wood when he enrolled in a diploma woodcarving course in Maori art at the Mihiroa Marae Training Center. At this center he found in practice and in teaching traditional Maori traits that he cherished: the spiritual, the respectful, the magical. He expects to receive his degree this year. Tiopira comments on the similarities between Japan and New Zealand. In geography they are alike. In earlier life and in enduring arts and crafts, both countries celebrate fishing and agriculture. Both love and use wood. The sun is central to the stories of both countries. Even the carved entranceway now in place at the New Zealand Embassy is symbolically comparable to the “torii” gateway of a Shinto shrine. Artist as he is, Tiopira is still a practical man. He has built his own home, for his wife, three children and himself, in Hawkes Bay, New Zealand. Vivienne Kenrick has just published “Woore at the Borders,” the story of the medieval Kenrick family manor, lost to others for a hundred years until Vivienne and her husband fell in love with it on their honeymoon and, after two decades of effort, returned it to the family. The account of history, home and Shropshire village life is available at the Foreign Correspondents’ Club, tel. (03) 3211-3161, and from Vivienne, fax (03) 3280-2485.